R U Secure, based in Wareham, Dorset and covering Purbeck, Swanage, Poole and Wimborne areas, are specialists in burglar alarm systems, fire alarms, CCTV and door entry systems. Their experienced engineers offer professional and cost-effective solutions to keeping your home and business safe and secure. R U Secure can provide a burglar / intruder alarm in Purbeck and local areas of Dorset for your home or business. Standard and bespoke security systems including wireless alarms are available enabling you to get the system that best meets your individual needs. From supply & installation to repairs, servicing and aftercare maintenance R U Secure will take care of any burglar alarm system in Swanage, Purbeck, Wareham, Poole, Wimborne & surrounding areas. A complete range of fire alarm systems are available to cover all of your home and business fire safety requirements in Dorset. 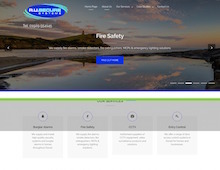 R U Secure’s services include fire alarm, smoke detector, fire extinguisher, MCP (manual control point) and emergency lighting installation & servicing. They cater to homes and premises of all sizes and requirements ranging from standalone fire alarms to entire fire alarm systems incorporating a MCP. Five different types of fire extinguishers are available with full installation and servicing to ensure your business needs in Purbeck, Wareham, Poole, Wimborne and Dorset are fulfilled. Protect your home or business in Swanage, Purbeck, Wareham, Poole and Wimborne with a CCTV system. R U Secure have options for smaller budgets and can install CCTV cameras standalone or as part of a larger security systems package. Your CCTV can be combined with an access control, door entry system and intruder alarm enabling you to monitor your home or business completely remotely, giving you extra peace of mind that you premises in Dorset are safe and secure. R U Secure engineers are experts in the installation and maintenance of door entry systems in Dorset. Whether you need access control in Wimborne, Swanage, Wareham, Poole or Purbeck, for your home or business, R U Secure have door entry systems to suit every level of requirement. Audio and visual door entry systems can be accessed remotely using your smart phone or tablet, enabling you to see and interact with anybody who may approach your door. Door entry access control systems can be installed alongside intruder alarms and CCTV as part of a complete security system to ensure the security of your home and business is second to none. Please contact R U Secure for further information or a free quote on burglar alarm systems, fire alarm systems, cctv, access control and integrated security systems in Dorset.